Mindi loved baseball...especially her home team the Mariners. Mindi got so good that she knew which batter was which by the routine they went through when they were up to bat. I could pretend to be one of the batters and she would know who it was everytime. 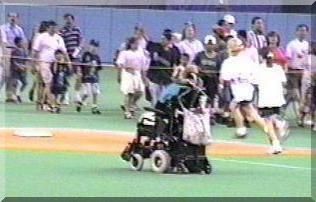 She even ran the bases. 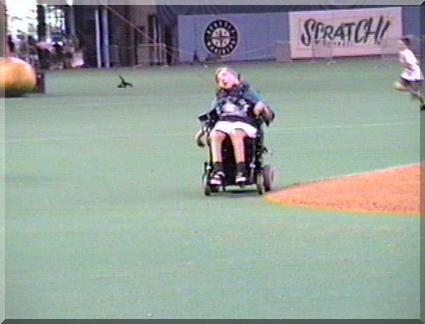 Well, she powered her wheelchair around the bases by using her head switch. After she passed second she wanted to go to the pitchers mound. The reason she wanted to do that, go to the pitchers mound, was because her favorite baseball player was a pitcher. 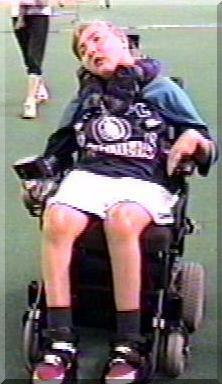 Mindi liked Jim because he was born with a handicap like Mindi was. We were watching a game one day and she kept trying to ask me something. She'd ask for a while, give up and then start in again. (Mindi couldn't talk.) Finally I saw what she saw. Jim was born with a deformed right hand. From that day on she started collecting his baseball cards.